Are utility leaders measuring the reliability metrics that matter? If the lights go off, customer satisfaction turns off with them, leaving everyone in the dark. At the end of the day, the most important measures of success for a utility company are reliability and customer satisfaction. Customers are the ultimate beneficiaries of reliability. So, which metrics should utility executives care about? And, how can project managers ensure their teams accomplish those reliability goals? There are loads of metrics that are relevant and important to utilities, but three, in particular, are crucial for tracking reliability success. The three metrics utilities care about influence each other and if mapped out, form a reliability triangle. 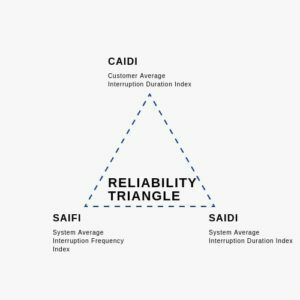 One point of the triangle is SAIDI, the System Average Interruption Duration Index. This is the average number of minutes a customer is interrupted in a year. It is important to keep the duration to a minimum because utilities are judged on customer satisfaction, and if there are long outages, chances are, the customer will not be pleased. The next point of the triangle is SAIFI, System Average Interruption Frequency Index. SAIFI is the average number of interruptions that a customer would experience. Closely related to SAIFI is MBI, the months between interruptions. Customers do not want their power to go down, and the best way to keep the customer happy is to keep the interruptions to a minimum. The third and final point, closing out the triangle is CAIDI, Customer Average Interruption Duration Index. CAIDI indicates the average outage duration that a customer would experience. If CAIDI is improved, there are fewer outages and for a shorter time, which means the customers are happier for a longer time. The triangle helps us understand their interaction. Reducing the frequency of outages improves SAIFI. In order to improve SAIFI, more preventative maintenance such as tree trimming and keeping maintenance equipment in tip-top shape should be done. If SAIFI is improved, it also improves SAIDI. If frequency and duration (SAIFI and SAIDI) are improved then CAIDI improves, as well. These are the metrics utility leaders should live, breathe, and dream about. But how do other stakeholders ensure utility leaders have access to accurate reliability metrics? Tracking SAIFI, SAIDI, and CAIDI can be difficult, but it does not have to be. Keeping track of each project from proper deployment to regular maintenance is necessary in order to improve reliability metrics. Sitetracker is a utility asset management platform that does just that. Sitetracker helps utilities to plan, deploy, maintain and grow. With Sitetracker, each project has a record of every site and asset in one place. This makes it easy to see where maintenance is necessary. As a result, utility project managers are able to pinpoint where they can make maintenance improvements that will increase reliability metrics. Demo the industry-leading project and asset management solution.